Following up on the award winning first series, Glitch returns with a second season in 2017. Now a Netflix Original, season two was entirely produced in 4K and continues the intriguing story of the 'risen' with all the twists and turns fans of the show expect. Having produced the VFX for the original series, Chroma's team return once again to deliver a huge range of visual effects for series two with over 400 shots delivered ranging from location augmentation and production enhancement, right through to stunts and surreal CG elements. The Matchbox production is directed by director Emma Freeman and Tony Kravitz and produced by Julie Eckersley. Glitch S2 heads to the ABC this year and is certainly not to be missed! Starring a diverse cast including Anthony LaPaglia, Wally Elnour and Kim Gyngell, this confronting story, set in the titular suburb of Sunshine, follows South Sudanese Pro basketball hopefull Jacob as he gets swept up in a police investigation. Chroma provided all visual effects for the drama with many production enhancements and location augments throughout the four part series. Sunshine is produced by Essential Media, directed by Daina Reid and heads to SBS later this year. With it's post apocalyptic setting, unique characters and dystopian style, Oddlands is certainly not your average production. Matchbox and the Back2Back theatre company, together with director Bruce Gladwin created the short which went on to premiere at the Adelaide Film Festival in 2017. Chroma provided a hundreds of visual effects for the film including production design support, location and stunt enhancement, digital animations and technical fixes throughout. The Kate's return once more to take down another classic Australian TV trope, the cheezy morning show format, in the form of ABC's Get Krackin! Produced by Guesswork Television, the 8-part series rips the morning show format a new one, with all of the salty language, razor sharp wit and fourth wall breaking fun from the same team that brought you The Katering Show. Chroma got sucked in too, tricked into providing a range of visual gags and digital tweaks throughout the series with some of the most bizarre requests we've ever seen. And the shows authentic interlaced video style required our team to produce all the digital trickery in the 50i format. Technical! Set your alarm early and start your day with Get Krack!n on the ABC this August. Popular Tassie-based sitcom, Rosehaven returns for a second series in 2017. Chroma produced several VFX shots for the series including landscape augmentations, production design enhancements and technical fixes. Rosehaven comes to ABC in 2017. Following on from the success of similar bio-dramas such as INXS, Molly and most recently Peter Allen, 'Olivia Newton-John: Hopelessly devoted to you' chronicles her rise through the 60's and 70's from her early beginnings in Australia and the UK, to her 1980's breakthrough into the US with Grease, Xanadu and more. Chroma have produced a huge range of VFX for the two part series, providing production design solutions across the many locations and eras and including complex archival integration, CG set extension, extras duplication, technical correction, motion graphics, opening titles and much more. 'Olivia Newton-John: Hopelessly Devoted To You' comes to the Seven Network this year. Chroma have completed work on a fascinating new short from Director John Harvey. 'Water' is set in a sparse post-apocalyptic landscape where we follow pregnant traveller, Layla as she wanders a bleak wasteland in search of water, only to find she's not alone. The 16 minute film features a wide variety of visual effects and CG integration to tell it's simple but powerful tale. 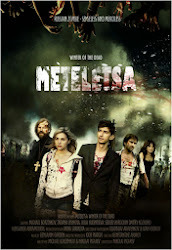 The team at Chroma provided VFX and broadcast design for the project. Keep a look out for WATER at festivals this year. Matchbox Pictures present Seven Types of Ambiguity, a psychological mystery based on the well known novel by Elliot Perlman that explores the complexities of relationships and the risks people will go to in the name of love. With direction by Matthew Saville , Glendyn Ivin and Ana Kokkinos and a diverse cast including Hugo Weaving, Alex Dimitriades, Susie Porter and Xavier Samuel, this series is not to be missed. Chroma produced a range of VFX across the six-part series from stunt sequences and location augments to practical effects and production design enhancements. Seven Types of Ambiguity comes to the ABC in 2017. Well travelled radio duo, Hamish and Andy are returning to screens once again after their long running 'Gap Year' series with a brand new show, True Story. Each week, the boys discuss a real life tall tale with their studio guest, then brought to life in hilarious recreations featuring dozens of cameos from some of Australia best known actors and comedians. The attention to detail that goes into the 10 episode series has kept us busy too with a huge range of locations, stunts, visual gags and other production solutions requiring the team at Chroma to use every trick in the book, from advanced compositing and live action augmentation to CG animation and integration, opening titles and more. True Story with Hamish and Andy comes to NINE in June. We have recently completed post production on upcoming feature film, Jungle. Directed by Greg McLean and staring Daniel Radcliffe, this Arclight release presents the incredible true story of Yossi Ghinsberg's ill-fated amazon expedition. Chroma produced a wide range of 4K visual effects for the feature including complex live action augmentation, CG animation, digimatte integration and a host of technical corrections throughout. Look out for Jungle in 2017. EndemolShine production, The Warriors comes to the ABC in 2017. Produced by Tony Briggs and Robert Connolly, the series follows the once-great Warriors football club as it pins its hopes to three untested rookies and a jaded star. The journey is especially confronting for Maki, the number one draft pick, who swaps his remote Aboriginal community for the bright lights of Melbourne. The Warriors is a fun and fresh take on the often serious business of professional sport, playing with the themes of identify, success and the lure of fame. Given the sporting theme, Warriors goes beyond to presents a rich range of locations and fun sequences. Chroma produced the series visual effects which included live action augmentation, advanced compositing, CG integration and animation. The Warriors comes to ABC in April. The team at Every Cloud (Miss Fisher's Murder Mysteries) is returning with an all new show for 2016. With an impressive cast, Newton's law stars Claudia Karvan as Josephine Newton, a suburban solicitor who's over developed sense of responsibility forces her back toward her glorious stint at the Bar. Every Cloud are adept at making digital augmentation part of there daily production toolkit, reducing shooting schedules and logistics while delivering unique locations, action and enhancements to production design across the show. Chroma provided VFX supervision and visual effects production across the 6 episode series, in addition to design and production the opening titles. Newtons Law comes to the ABC in 2017. The Edge of the Bush is one of the upcoming productions from the Screen Australia / ABC Long Story Short initiative launched earlier this year. Created and starring Anne Edmonds (Fancy Boy) and Directed by Kate McCartney (The Katering Show), The Edge of the Bush follows a classic suburban family as they battle with the loss of their calisthenics empire. With many of the characters played by Anne, Chroma were brought in to create some of the doubling shots peppered throughout the production in addition to a variety of composites and technical fixes. Edge of the Bush comes to iView soon. Dance Academy: The Comeback hits the big screen in 2017. Based in the popular ABC3 series, the film takes Tara's dreams of stardom to new levels with direction by Jeffrey Walker (Jack Irish, Banished) and shooting locations from Sydney to New York. Chroma provided a range of complex digital removals, augments and technical fixes for the feature. "Better watch out" (Originally 'Safe Neigbourhood') is a US feature due to release at the end of 2016. 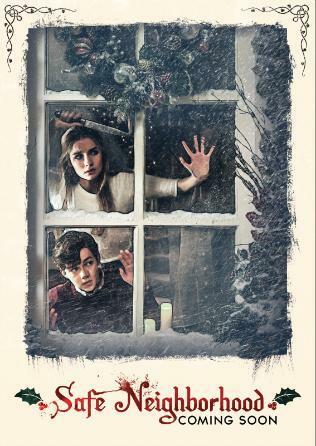 Directed by Chris Peckover and staring Virginia Madsen, Patrick Warburton and Olivia DeJonge, a Christmas babysitting gig turns into a deadly game of survival. Chroma were commissioned by StormVision Entertainment to deliver a range of visual effects and technical work across the production, with over 50 shots produced from stunt enhancement, rig removal, digimatte integration, production design enhancement, sim travel and more. "Better watch out" hit screens in late 2016. The Wrong Girl is the latest drama to come from Playmaker, based on the popular book by Zoe Foster Blake. With an eclectic cast and kooky style, The Wrong Girl follows cooking show host, Lily and her housemate, Simone as they decide to take a break from men, just as a handsome new chef joins the team. Chroma produced several VFX shots for the show, which is due to air on Ten later this year. Set in a future time of interplanetary colonisation, an unlikely pair are forced together to rescue a young girl amidst a global crisis orchestrated by a shadowy military contractor. Directed by Shane Abbess and staring Kellan Lutz, Daniel MacPherson and Rachel Griffiths, SFv1: The Osiris Child hits screens in 2016 with Chroma providing some technical fixes for the film. Matchbox's new crime drama, Hyde and Seek comes to Nine this year. Matt Nable stars as a police detective on the trail of a killer who is stalking his friends and family, drawing him ever deeper into a world of unbridled crime where everyone has something to hide. The team at Chroma produced the visual effects for the series, including complex location augmentation, day for night sequences, stunt fixes and production design enhancement. Chroma also designed the opening titles for the show. Hyde and Seek comes to Nine later this year.